Clowns give me mixed feelings. Having watched Killer Klowns from Outer Space at too young an age, they terrify me. And having seen a clown dejectedly make unwanted balloon animals at a party where all the kids were too old, they also make me inexpressibly sad. 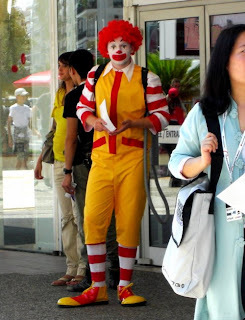 Anyway, Ronald McDonald was outside the Palais today, wearing jetpacks of all things. He was doing this big dog and pony show for whoever reared a camera in his direction. Seeing him made me frightened, and when I'm scared I get mad, hence the venomous video. Afterward I tried taking incriminating potshots of him leaping around and being generally objectionable. But then he looked at me -- right at me -- and gave me that Sad Clown Look. And my heart exploded into tiny little glass pieces. Every time I look at the picture below, I want to cry. Clowns: gift-wrapped radiators of fear and melancholy. This is something a Happy Meal can't fix. Cannes Lions: More Ambient Guilt Lubrication. Futzing with Gchat Vid Chat.